Exhibitions Intern Megan Fatharly interviews artist Janine Baldwin, whose work Cropton Forest I (above) won The Haworth Prize, worth £5,000, at The New English Art Club Annual Open Exhibition 2015 at Mall Galleries. “I was so pleased for her,” says Megan about Janine winning the prize, “…as when I first viewed the exhibition I was drawn to her work because of how she managed to make a chaotic scene appear calm and tranquil”. Megan Fatharly: How important is drawing to you and how often do you do it? 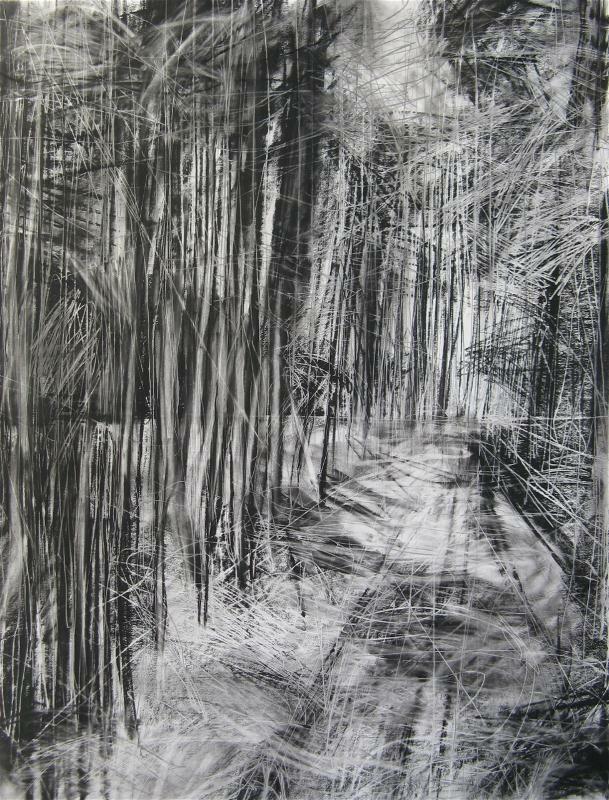 Janine Baldwin: Drawing is absolutely integral to my artistic practice. Even in my painting, I use oil bars (oil paint in solid form) to allow me to draw on the canvas alongside brushwork. Drawing to me is immediate and spontaneous and I try to channel a lot of energy into my drawing. MF: How did you become involved with Mall Galleries, and how has winning The Haworth Prize helped your career so far? JB: I first exhibited with Mall Galleries in 2011, when my work was selected for the Society of Women Artists Annual Exhibition. From there I became interested in their other open exhibitions and I had my work selected by The Pastel Society in 2013, 2014 and 2015. In 2014 I was delighted to receive The Arts Club Charitable Trust Award for my work After the Rain at The Pastel Society exhibition. This year I was honoured to win The Haworth Prize which has been fantastic on so many levels. It brings my work to new audiences, both in the gallery space itself and through online and printed publicity for the shows. I would encourage any artist to submit work for the Mall Galleries’ open exhibitions as they put together diverse shows of an excellent standard, and being selected can lead to a whole range of opportunities. Artists can also apply to become a member after acceptance into consecutive shows. MF: What’s been your favourite piece you've created? JB: I can’t pick a favourite but I feel that my work is evolving all the time, which is exciting. I like different phases of my work for different reasons. MF: What artists influence you? JB: Willem de Kooning, Patrick Heron, Cy Twombly, Joan Eardley and Peter Lanyon are amongst my absolute favourites. 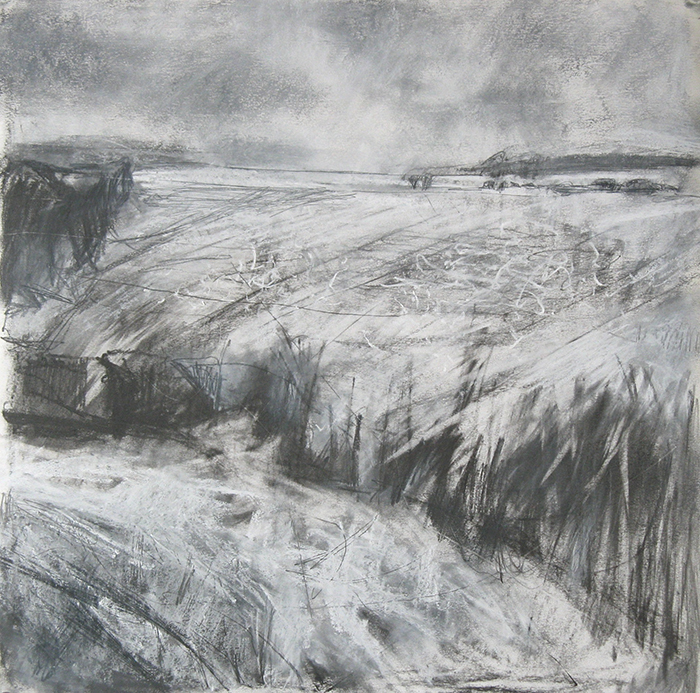 More recently, as I have been developing monochromatic work, I find artists such as Emma Stibbon inspiring. MF: How do you market yourself as an artist? What do you find has been successful and not so successful? JB: I always make use of listing sites and databases which showcase artwork, and social media also plays a vital role in sharing information and new work. Newspaper articles are still a great way to reach thousands of people therefore getting to know your local arts editor is a good idea. I wouldn’t necessarily advise paying for adverts in magazines as it is often expensive and there is no guarantee the advert will be seen. MF:When is your next up and coming exhibition? JB: I will be taking part in a summer postcard show in my homewtown of Scarborough. It has been fun to make 4"x6" postcards and an ideal wat to try out new ideas and mediums without the commitment of a larger canvas or paper. MF: What places inspire you? JB: The landscapes and seascapes of Yorkshire are really where my heart is and I have returned to them repeatedly over the years. I am very focused on forests at the moment such as Cropton Forest and Silpho Forest, both in North Yorkshire, and I will never tire of the coastlines here in Yorkshire. Some have such a wild and remote feeling and the combinations of light, weather, colours and atmosphere are infinite. Submitted 3 years 9 months ago by Liam Kilby.